Montreal WiFi hotspots offering free wireless Internet access are increasingly everywhere, a boon for any traveler or local looking to avoid smartphone roaming fees and data usage fees. But as much as city hall wants "to position Montréal as a world leader among smart cities" as it declared back in May 2015, the city still has ways to go before free WiFi zones dominate public spaces. Expect much of the Mile-End neighborhood, Boulevard St. Laurent, Ste. Catherine Street, rue St. Denis and boulevard Mont-Royal to join the wireless network by the summer of 2018, if not sooner. In the meantime, you have to know where to look. The first step in deploying city hall's MtlWiFi free WiFi network across key urban areas and commercial corridors, most of Old Montreal is a free Wi-Fi zone, including around Palais des Congrès, the Notre-Dame Basilica and the Bonsecours Market, among other neighborhood landmarks. Here's a map of the coverage zone. Most of Montreal's downtown shopping malls offer shoppers free WiFi. That includes much of Montreal's Underground City. Montreal's entertainment district better known as Quartier des Spectacles offers free WiFi. That zone goes as far east as Place Émilie-Gamelin and as far west as public square Place des Festivals which loosely connects with Place des Arts and nearby shopping destination and free WiFi zone Complexe Desjardins. 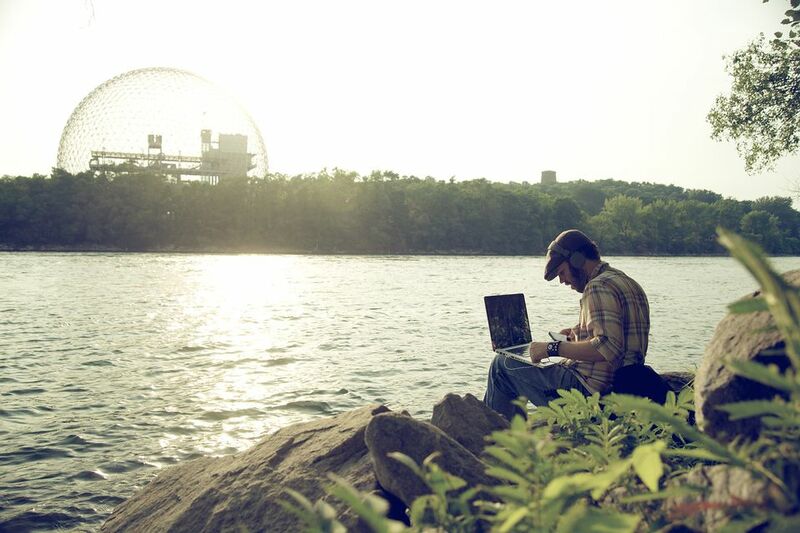 Certain parts of Parc Jean-Drapeau offer free WiFi. Check the Parc Jean-Drapeau map to find out where those spots are. The Montreal Gay Village's merchant association claims that it was "the first commercial sector of Montreal to offer free WiFi access over a territory of more than 1.5 km." In warmer months, linger in the Village's car-free zone along Ste. Catherine Street, its main commercial artery. Montreal airport Montréal-Pierre Elliott Trudeau International offers free wireless internet access. Of course, a variety of commercial establishments offer customers free wireless internet access across Montreal. A certain international coffee shop conglomerate springs to mind. But there are hundreds more free WiFi zones in the city. And the following non-profit service is particularly useful for finding them. For 12 years, it operated under the name Île Sans Fil (that's French for "wireless island") but it has since absorbed itself into the Quebec ZAP movement, functioning as its Montreal chapter. Check the ZAP's wireless network map for a comprehensive view of free publicly-accessible WiFi zones across Montreal, be they libraries, bistros, cafés, parks, community centres and other commercial establishments and spaces which have joined the non-profit movement since its inception.